Yesterday market showed a strengh coming back to the market. Yen also bouced back from 103.20 to 104.70/dollar after strong housing data and Durable goods datafrom US. 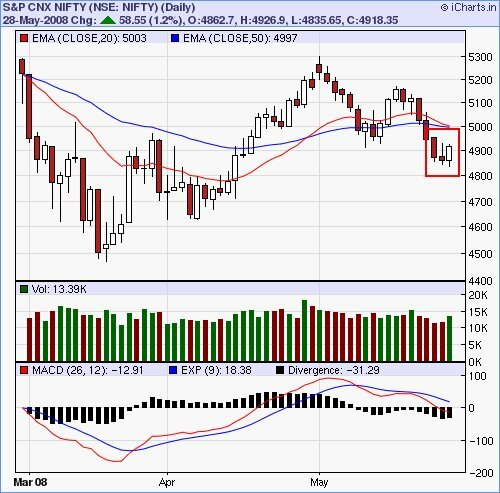 But this positve movement in nifty may be shortlived as Market is making lower tops and lower bottoms.As for the market sentiment prevailing now anywhere between 4990-5025 remains Nifty's maximum upside. Breakout above is a Clear bull Signal. Yen also currently facing resistance at 105.26 any break out above may initiate fresh FII Investment in emerging markets like India. Tata Steel, Divis Labaratories, Tata Motors stocks shows strength and remains a valuable pick now for medium term gains.